New in 2016, the Lincoln Art Center began offering a wine and paint class each month, called "Gogh Paint." 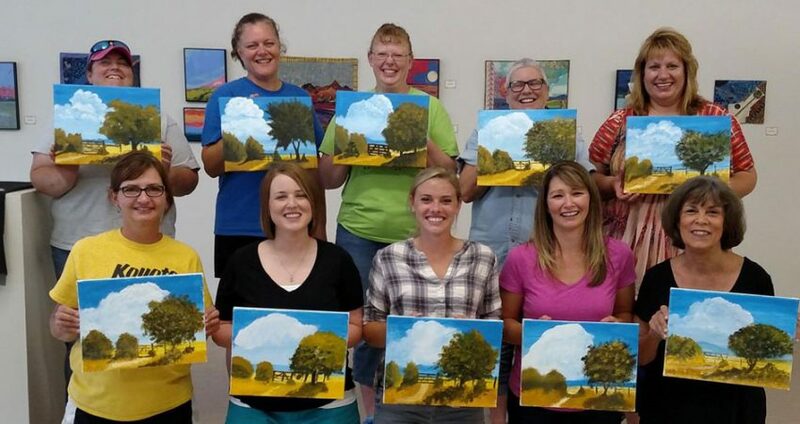 New in 2016, the Lincoln Art Center began offering a wine and paint class each month, called “Gogh Paint,” based on the popularity of such classes at other venues around the Midwest and it has been a hit in Lincoln, KS too. Everyone is invited to join the classes, no previous artistic talent or experience required. The most important thing to remember is convince a friend (or two or three) to join you for an evening of jokes, laughter, silliness, and maybe even a sense of accomplishment too when it is all said and done. Each month a new scene is announced, so you want to sign up early to guarantee your spot at the table. Lincoln Art Center director Joyce Harlow acts as the class instructor and sets everyone up with a canvas, sometimes with pre-drawn images, and the acrylic paint and brushes to get started. When everyone has arrived and settled with a glass of their favorite beverage (BYOB), she starts at the beginning with suggestions on where to start, what colors to use (or how to mix them) and what brush is best. She progresses the students through each step towards completing a full scene, with tips on how to manipulate the brushes to create texture and movement for a realistic look. In the end, whether it’s the wine talking or not, everyone is usually all smiles and proudly photographing their new artwork for all their friends to see!